Does your packaged food meet the new country of origin labelling (CoOL)requirements? 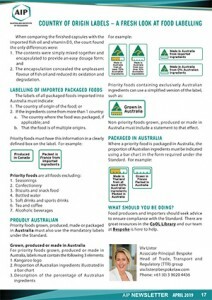 Food packaged after 1 July 2018 for sale in Australia must meet the CoOL requirements under the Australian Consumer Law Country of Origin Food Labelling Information Standard (Standard). However, food businesses risk considerable penalties if labels applied after 1 July 2018 have not been satisfying the CoOL requirements. If the court cannot determine the benefit obtained from the contravention, 10% of the annual turnover of the company in the 12 month period ending at the end of the month in which the contravening act or omission occurred or started to occur. Mandatory labels for imported foods and packaged foods ‘grown’, ‘produced’, ‘made’ or ‘packaged’ in Australia.